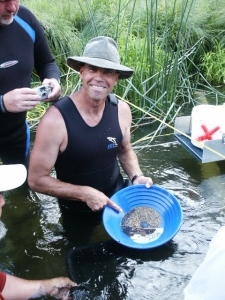 To succeed at gold dredging, you should be willing to take a rather athletic approach toward the work, especially during the sampling stages. 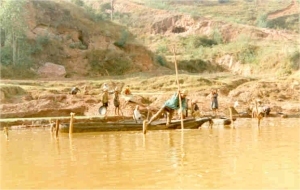 Gold dredging consists mostly of physical activity. Heavy gear has to be carried around from place to place. Much of your time is spent wrestling with a suction hose, picking up and tossing cobbles as fast as you can, shoving against boulders, fighting to hold your position against the water’s current, packing 60-plus pounds of lead around your waste, swimming back and forth across the river, and pulling dredges around on ropes. There just never seems to be an end to the physical work! This is not bad. Unless you don’t like hard work. If you have a distaste for hard, strenuous work, if you don’t enjoy it and are generally looking for ways to avoid it, you need to find some line of work other than gold dredging. To succeed at gold dredging, you should be willing to take a rather athletic approach toward work, especially during the sampling stages. Some people are physically-inclined by nature, and they enjoy hard work. Other people are not so physically inclined, but they are willing to work hard and do whatever it takes to succeed. Such people can be very successful at gold dredging. But, no matter what your inclination, gold dredging requires hard work. There is no getting around it. I have found, to be most effective, it is best to attack a gold-dredging operation with a rigid work schedule, just like any other job or business-activity. I personally prefer to “pour on the steam” for three straight days. Then, I take one day off from dredging to allow my body to recuperate. The work is physically exhausting on the body if you really pour out the energy. You need to find the appropriate rest-interval that works best for you. Otherwise, your body will get overworked and start breaking down. I use my day-off to perform gear maintenance and the many other miscellaneous chores that are needed to keep the operation running smoothly. I try to get some much-needed free time out of it, as well. My approach is not the only way. I know successful gold dredgers who prefer to work fewer hours each day, or work at a less-intense level of physical activity; but they put in five or six straight days at a time. If we could add up the total units of energy expended on dredging, it would probably come out about the same, either way. It is just a matter of preference and what pace you are most comfortable with. The main point here is that no matter how you cut it, you’ve got to put in the dredging hours if you want to succeed at underwater mining. When people ask me about gold dredging as a profession, I always answer as follows: “Given the knowledge of how to do it, and the willingness to apply the knowledge, gold dredging is an easy way to make a living, if you are willing to work hard at it.” And, this is the simple truth. 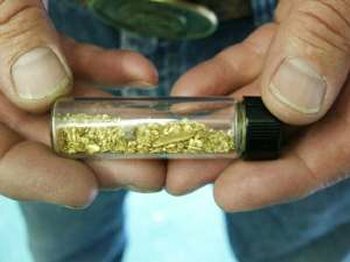 Specialized metal detectors will detect gold well-enough that they will sound-off on nuggets, deposits of smaller pieces of gold or even very small individual flakes of gold. It is important to point out that no two gold-bearing areas are exactly alike. An approach which might work better in one area, might not work very well in a different area. So, the purpose of this article is not to tell you what I think “the best” approach is. It is to give you information about each of the different approaches, so that you can gain a larger bag of tools to use when confronted with different situations out in the field. I should begin by mentioning that the type of electronic detector used to find gold and other precious metals is not a “Geiger counter.” A Geiger counter is an entirely different electronic tool which is used to detect radioactive elements. The type of electronic device used to prospect for gold is called a metal/mineral detector (“metal detector,” for short). Metal detectors are quite simple to use (once you understand them), and can be helpful in assisting you to locate gold or silver deposits or specimens once you have gained some personal experience in using one properly. While they are rather simple to use, it does take some practice with a metal detector before you can use one proficiently in gold prospecting activities. There are many different models of metal detectors being offered on today’s market, most which are more useful to the treasure hunter than the gold prospector (two entirely different fields of detecting activity and procedure). Those detectors of most use to gold and silver prospectors generally fall under two separate categories: Beat Frequency Oscillator (“BFO”), and Very Low Frequency (“VLF”). First we will take up the BFO, which is the simpler of the two—but is less-often found these days, due to the substantial electronic advancements of VLF detectors. An iron object which has been in the earth for an extended period of time, and having thoroughly oxidized, will usually read-out on a metal detector as a mineral instead of a metal object–which it no longer is. So the two basic settings on a BFO detector are “metal,” electrically conductive targets (gold and silver), and “mineral,” non-conductive magnetic particles (magnetic black sands). The various models of detectors have different ways of sounding-out on reading targets. Some detectors have a light which turns on and off. Some have a meter with a needle on a dial–which will also give you an idea of the intensity of the signal given-off by various targets. Other detectors have a tone which changes in volume or pitch when passed over a reading target. Some newer-model detectors have an LED display which spells-out the different types of targets being encountered. Some detectors have a combination of these features. Generally, the best type of metal detector for prospecting purposes is the type which includes an audio tone in which the audio pitch changes when the search coil is passed over a reading target, and which also allows a set of headphones to be connected. The advantage to using headphones while prospecting is that you can shut out the background noises from the surrounding environment and concentrate more intently on even the smallest audio changes which can and do occur while searching. On most tone-changing BFO detectors, the tone will not only raise in pitch when the search coil is passed over a target for which it is set to sound, but it will also lower in pitch when the search coil is passed over a target of the opposite setting. For example, if a BFO detector is on the metal setting and is passed over a large gold nugget, the detector’s audio tone should rise in pitch. If the detector on the same metal setting is passed over top of a high concentration of magnetic black sand, the audio tone should lower in pitch. The same thing holds true in the opposite for the BFO detector which is adjusted to the mineral setting. One other interesting thing to know about BFO detectors is they generally sound-out on the most dominant element, either “metal” or “mineral,” whichever is most present in the ground which the detector is being passed over. For example, if you are passing the search coil over ground which contains gold (this would read as a metal), yet there is a large amount of magnetic black sand in the same ground, it is likely that the BFO detector will read-out on the black sand as a mineral while ignoring the gold. Equal reading-amounts of both metal and mineral elements in a section of ground, in any quantity, will prevent the BFO detector from sounding-out on either element. Because BFO detectors read-out so well on highly-mineralized ground, the presence of highly-mineralized ground tends to block-out reading traces of gold which lie in or under. This is known as “interference” in the electronic detecting field. Magnetite (magnetic black sands) has such a strong affect on metal detectors, that a concentration of only one percent magnetite in the ground may create a signal-imbalance which is hundreds of times stronger than the signal which might be given off by a small gold nugget. So, a mineral reading on a BFO detector does not mean there is no gold present, only that there is heavily mineralized ground—which may be blocking-out gold readings. 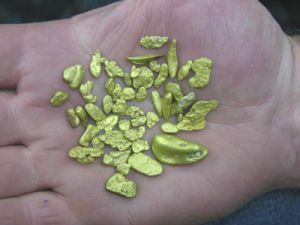 One of the problems in electronic prospecting is that gold targets are often associated with highly-mineralized ground. Therefore, as a tool, the BFO has its advantages and limitations. In some prospecting situations, it can be very helpful to have a device which is good at pinpointing areas of concentrated heavy mineralization. The BFO does this exceptionally well. This is further-discussed in my other article on this subject: Prospecting for Gold with a Metal Detector. Some places where nuggets and larger flakes of gold become trapped do not allow heavy concentrations of black sand. One example of this would be a location (rapids) where the water runs fast over top of exposed bedrock during major flood storms. Such areas can be well out of the active waterway and directly accessible to metal detecting. BFO detectors can be very effective at helping to locate gold targets in places where heavy mineralization is absent. Unfortunately, as a metal, gold is generally not picked-up very well by metal detectors. This is a comparative statement. Gold does not sound-off on a metal detector nearly as well as an iron object of the same size and shape. However, specialized metal detectors will detect gold well-enough that they will sound-off on nuggets, deposits of smaller pieces of gold or even very small individual flakes of gold. No metal detectors are able to detect particles of gold dust at the time of this writing. This is probably a good thing, however; because there is so much fine gold spread throughout gold country that it would probably create additional interference problems on a sensitive gold detector. Therefore, in electronic prospecting for gold, we are looking for flakes, nuggets and accumulations of gold. These are targets which will add up more quickly to something of good value. It is important to understand that different makes and models of metal detectors are not equal in their ability to detect gold objects. Some detectors will just barely sound-out on gold objects. Others will not sound-out at all. I highly recommend that any person who is buying a metal detector for gold prospecting purposes should bring along some samples of natural gold to test the various detectors before deciding which one to buy. Small samples of natural gold and small nuggets are readily available by doing a search on the Internet or contacting a prospecting shop. This is to be sure that the metal detector you do buy will sing-out well when it is passed over natural gold objects, even very small gold targets. If a specific detector will not sound-out on gold held in the air, it will most-likely never detect gold targets located in the ground. 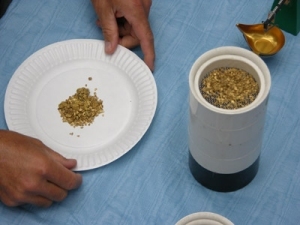 When testing-out the various detectors, it is better to use natural gold samples—like nuggets, flakes or a sample bottle filled with smaller-sized gold,. Some detectors will, and some will not, sound-off on small bottles that are filled with fine gold. Using natural gold targets is better than using a gold ring or some other type of jewelry. Jewelry is nearly always made of gold which has been alloyed with other metals (like copper)—which may read-out on a metal detector better than natural gold objects. Therefore, gold jewelry might give you a wrong idea about how well a metal detector will sound-out on natural gold targets. The best detectors for finding gold are not necessarily the most expensive. Varying costs in detectors are sometimes in proportion to the amount of additional electronic circuitry that is built into the detector for extra features. These sometimes have little or nothing to do with the detector’s capability of locating gold targets. Gold targets give a solid, mellow sound on a metal detector, similar to lead or brass. Pieces of steel wire and bigger nails usually give a stronger beep—or often a double beep. Metal detectors read-out on gold better as the pieces become larger. 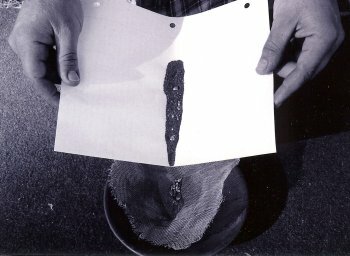 As an example, an average gold detector might sound-out very well when its search coil is passed over an eighth-ounce nugget from several inches away, yet not sound-out at all when passed over three times as much fine gold accumulated in a glass jar at the same depth or distance from the search coil. Actually, it is not just the size of the target which counts. The object’s shape also makes a difference, and also the direction which a target is facing. A larger, more solid surface-area of gold will sound-out stronger. 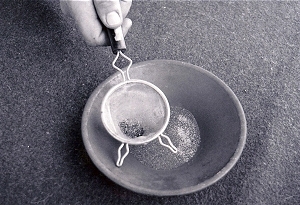 For example, a flake-shaped nugget is likely to sound-out better on a metal detector than a round nugget of the same weight, as long as the flat-surface area of the flake is facing in the direction of the metal detector’s search coil. Also, coarse and irregular-shaped nuggets, as commonly found in dry placer areas, residual and eluvial deposits, do not generally sound-out as well as nuggets which have been worked-over and pounded by flood storms in a streambed (because these are more dense and solid). How tightly a gold deposit is concentrated also makes a difference in how well it will cause a metal detector to sound-out. 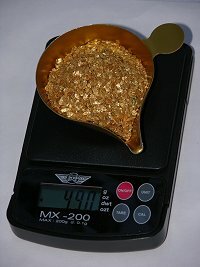 Whereas a quarter-ounce of flake-gold inside of a jar might sound-out well on a particular detector, perhaps two ounces of the same flake-gold spread-out over a slightly larger area might not read-out at all with the same detector when the targets are at the same depth beneath the surface. This is one factor which is important for the gold prospector to realize: Any metal detector wills read-out on tighter concentrations of gold better than larger amounts of gold which are more widely dispersed. Metal detectors will also read-out on nuggets (larger solid pieces of gold) best of all. How deep into the ground that a specific metal detector will sound-out on an object depends upon various conditions. Surprising to many, how much a detector costs may not have much to do with its depth-sounding capability. In fact, some of the less-expensive models are able to probe deeper, and pick up on gold better, than some of the more expensive detectors. The Federal Communication Commission has put a maximum limit on the signal-strength which can be used in metal detectors. So the idea that a more expensive model puts out a stronger signal to probe deeper is simply not correct. The type of object has much to do with how deep into the ground that it can be located with a metal detector. Different kinds of objects have varying amounts of magnetic and electrically-conductive properties. Therefore, they affect metal detectors differently. Also, some detectors will sound-out on some kinds of objects better than others. As mentioned earlier, gold is not one of the better-reading metals, so cannot be picked-up with a metal detector as deeply as an iron object of similar size and shape. Another factor which determines how deep an object will be picked-up by any detector is the size of the object itself. Whereas a 2-pennyweight nugget (1/10th ounce) might be picked up five inches deep into the ground with a certain metal detector, a 5-pennyweight nugget (1/4 ounce) might be picked-up eight inches deep into the same ground with the very same detector. How much an object has deteriorated and has been absorbed into the soil is another factor in how deep the object will be picked-up. Iron objects tend to oxidize and become slowly absorbed into the surrounding material. This causes the target to appear larger and read-out more strongly, so it will be picked-up at greater depth with a metal detector. Once such a target has thoroughly deteriorated as an object, it will stop reading as a metal and start reading as highly-mineralized ground. Gold does not oxidize or deteriorate, so this factor does not apply to natural gold targets. The size of a search coil on a metal detector is also a factor in how deeply the detector will locate objects. Larger coils generally are able to detect objects at greater depth than smaller coils. But they generally do not have as much sensitivity in detecting smaller gold targets. Smaller search coils have greater sensitivity to small objects, yet do not have the depth-probing capability that larger coils do. Medium-sized coils, from five to eight inches in diameter, often combine the features of having both a reasonable amount of sensitivity for the smaller objects, and acceptable depth-scanning ability. One thing to keep in mind is that a larger coil will also increase the size of the area being covered by each sweep. 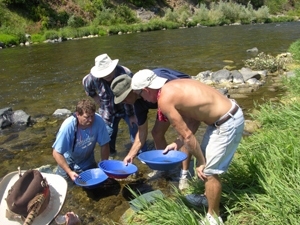 Many nugget hunters prefer to have a smaller search coil handy, because it produces the greatest small-object sensitivity (gold flakes), and because the smaller coils can get into tighter spots—like in and around tree roots and inside of exposed crevices in the bedrock, where nuggets are most likely to be found with a metal detector. Almost all detectors today are made so that various-sized coils can be attached, depending upon what they are to be used for. When testing a detector, do not make the mistake of assuming that if the device sounds out well on a gold sample when using a coil of one size, it will also sound-out well when using a coil of a different size. Your best bet is to test the detector with the various-sized coils to see which work best for your particular needs. 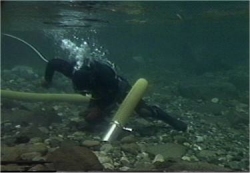 One of the most important factors determining how deep a metal detector will sound-out on a gold object is how much mineralization (interference) is present in the ground that is being prospected. More minerals equal less depth. This is especially true of BFO detectors. Because black sands usually exist, and sometimes actually concentrate, within the very same streambeds or soils where gold deposits are located, metal detectors are not always used to directly detect gold in streambeds or material of substantial depth. They are sometimes used to scan places where there is a very shallow amount of gravel or material (if any) present over top of the gold (exposed bedrock). One excellent use of the BFO detector as a prospecting tool is to locate concentrations of black sands in a streambed. Black sands often accumulate in the very same locations that gold does (pay-streaks). From your fundamental knowledge of placer geology, after potential pay-streak locations have been pinpointed, those specific areas can sometimes be scanned with a BFO detector to locate the increases in other heavy elements. 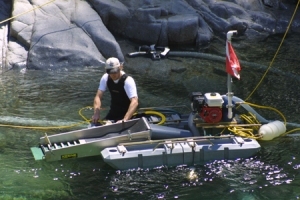 Specific sites which sound-out heavily on the “mineral” setting can then be sampled by conventional gold mining techniques. The VLF detector is a more recent development in the field of electronic prospecting. Very Low Frequency detectors may come under other names or descriptive abbreviations such as VLF, GEB, MF, GCD and others. These are designed with circuitry which is able to cancel-out the effects which highly-mineralized ground has on a BFO detector. VLF detectors have the ability to look through or past highly-mineralized ground and detect metal objects (gold) that may not read at all on a BFO metal detector. 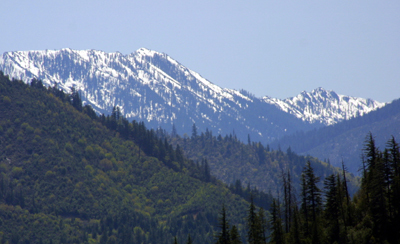 The VLF, being able to cancel-out interference caused by mineralized ground, is more suited for locating gold deposits and gold specimens directly. However, it still remains true that gold targets will have to be large enough, or located close enough to the surface, or deposits will have to be tightly concentrated enough, to sound-out on a VLF, just as with a BFO detector. Just because a particular detector is of VLF design, does not mean it will sound-out well on gold. In fact, there are some VLF detectors which have difficulty in sounding-out on gold samples at all. So this type of detector must be just as thoroughly tested using natural gold targets before buying for prospecting purposes. The VLF detector, being a mineralization-cancelling device, sometimes does not have the ability to detect the heavy black sand concentrations the way a BFO detector is able to. Consequently, a VLF is more often better-suited for scanning directly for gold, whereas a BFO is generally better-suited in helping the prospector locate gold deposits in an indirect sort of way, by finding the highly-mineralized ground within a gold-bearing area. VLF detectors are sometimes also constructed with discrimination circuits that are designed to cancel or identify specific types of targets—like bottle tops, aluminum foil and pop-tops. For the most part, this type of electronic circuitry is better-suited for treasure and coin hunters. When used in prospecting for gold targets, discrimination circuitry sometimes has a tendency to also reduce the detector’s depth-probing capability, especially in highly-mineralized soil or streambed material. Since gold targets are already difficult to locate, it can sometimes be better to not utilize additional circuitry which could hamper sensitivity towards gold. 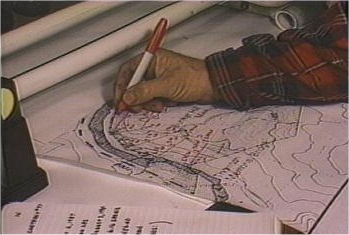 However, some conditions do exist in which discrimination circuitry may assist a gold prospector. If using such a detector, always test it against a sample-nugget planted in or on the ground that you are probing, to determine whether or not you can trust the discrimination circuitry. 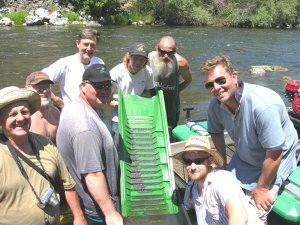 There is a lot to be said about having a small natural gold target along with you at all times when you are prospecting for gold with a metal detector. This way, each time you decide to try something new to try and get the most out of your detector under changing circumstances, you can confirm the results using a target which is similar to what you are hunting for. It is common for electronic prospectors to glue a test-nugget for this purpose to a poker chip, which can be tossed to the ground and easily spotted again. Some of the newer, specialized VLF gold detectors are utilizing specific discrimination circuitry called “Iron Identifiers.” This does not necessarily reduce the total depth capability in the detection of gold targets. In other words, the circuitry will identify iron objects which are nearly certain to be iron. The downside to the use of such circuitry is that if an iron target is too deep or too small, it might still be identified as iron. Also, if the ground is highly-mineralized, the accuracy of iron-identifying circuitry is likely to be reduced. The best gold detectors which use a meter or other display to identify different types of objects, do not route the discrimination function through the same circuitry that produces sound variations through the headphones. In this way, you can obtain optimum depth probing and object sensitivity to your ears, along with some added visual ability to pre-identify what is sounding-out on the detector. This is all about reducing the amount of trash targets that you must dig up while looking for gold. Some experienced electronic prospectors utilize discrimination circuitry (turning it on and off accordingly) only after a target has been located. This way, depth and sensitivity is not forfeited during preliminary searching. Other experienced prospectors insist that no discrimination circuitry is needed. Once you are familiar with the area you are searching, and know the specific audio tone changes of gold and/or trash targets, you will form your own judgment of which targets (sounds) to dig and which targets to leave alone. 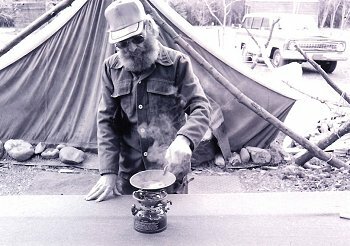 Different prospectors have different methods. Also, different locations often require different methods. Some experienced electronic prospectors simply dig every target (sound). Some VLF detectors are made with circuits designed to analyze targets. This means they are able to tell you if the target is a nail, bottle top, a nickel, silver dime or a piece of gold. Such circuitry has only limited accuracy in electronic prospecting; because highly-mineralized ground tends to interfere with the signal and can give a false reading in the analyzer. Still, the added capability can be useful. None of these circuits are a problem with multipurpose detectors, providing the special circuits can be shut off or bypassed—and/or providing the additional circuitry does not hamper the detector’s efficiency in locating gold and silver targets. Some VLF detectors are designed with manual ground-balancing controls, and others are designed with automatic ground-balancing circuitry. Some prospectors prefer the manual controls. Others prefer automatic ground-balancing. 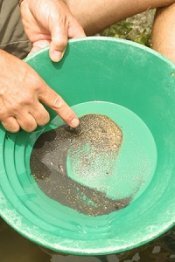 There is nothing wrong with automatic ground-balancing circuitry in gold prospecting, as long as it is fast enough to keep up with the rapidly changing mineralized conditions of the different areas you intend to prospect—and as long as the additional circuitry does not hamper the detector’s ability to locate gold and silver targets. Some VLF detectors have been specifically designed as gold prospecting tools. Since most specialized gold detectors operate at a higher transmitting frequency, have extensive ground-balancing capabilities, and have special circuitry to avoid sensitivity overload in highly-mineralized ground, they definitely do have some advantages in their ability to locate small gold targets over most multipurpose detectors—or gold targets which are deeper in the ground. The high-performance of some of today’s specialized gold detectors even make pinhead-sized gold targets recoverable. Which detector you choose to buy will depend upon what you plan to use the detector for. If you plan to only use it for prospecting purposes, a special gold machine is probably best for you. If you intend to search for coins, caches, artifacts and lost articles, as well as prospecting for gold and silver, perhaps a multipurpose detector is best—or two separate detectors. Only you can decide. I would suggest you buy your detector from a dealer located in the general area where you plan to prospect for gold. The local dealer will know which detectors are performing best in that area. Local dealers will also introduce you to other prospectors, and perhaps a local prospecting and/or treasure hunting club or association. Communication with local prospectors can be a very big help in determining which detectors are best for specific areas. You can also get tips from them on productive places to prospect with your detector. No detector made is the best for all locations. Some machines work better than others in wet or dry conditions. Some work better in hot or cold climates. Some detectors are affected by alkali “salts” in the soil or gravel more than others. When any of these examples is the case, a smaller coil might manage adverse conditions better than a larger coil. Each area is different. Another reason to purchase your detector from a local dealer is the help and support that you will receive. Success in the field comes from understanding the workings of your detector, and perhaps receiving inside information on good places to hunt. The money saved by buying from a discount mail-order house may not be worth the loss of support you would otherwise receive from a local dealer—especially when you are just beginning. When buying a detector which you intend to use for prospecting purposes, keep in mind that probably the most important feature is the detector’s capability of cancelling the heavy ground mineralization found in most gold-bearing areas. Practice makes perfect. You must start with good equipment. The rest will be up to you. DRILL No.1: Take a file or electric grinder to a piece of iron or steel (like a nail), and allow the fine pieces of metal to fall into a container. Pour some filings onto a piece of paper and pour some glue over the filings to hold them intact. Pour more filings on top of the glue and then pour on more glue. Continue this until the conglomerate is giving off a strong mineral reading on your detector. Make three different sheets of mineralization; one giving off a very mild mineral reading, one causing a medium signal, and one which gives off a strong signal. If you are already an experienced gold prospector, and have some black sand concentrates lying around somewhere, use a magnet to collect some magnetic black sand and use these instead of iron filings. Sometimes, you can get prospecting supply outlets to send you a small package of black sand concentrates. 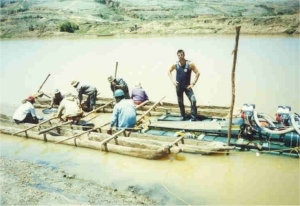 You can also find bags of mineral concentrates (which usually include some gold) which various sellers on the Internet market as panning sands. These are better than using a machine to create iron filings, because they are the actual material that you will encounter in the field. These different mineralized conglomerates will give you a good idea of how your detector will react to different degrees of mineralized ground. 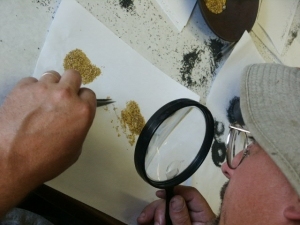 DRILL No.2: Acquire at least a half-ounce of placer gold, preferably more, with a variety of fine, flake, and nuggets so a wide range of testing can be done. Carefully place the gold in a pile on a clean sheet of paper in a location where there is no other metallic object reading on your detector. Scan the gold with your detector from varying distances to get an idea of your distance-capabilities when scanning a concentrated gold deposit. Now spread the gold out over a slightly-wider space on the paper and scan again to check distance. Continue to spread the gold out wider and wider until it no longer reads on your detector—or until you are picking up on individual flakes of gold. This drill will give you a good idea of what sized pieces and accumulations of gold will sound-out at what distances. Try different coil sizes to see what their capabilities are. Pay particular attention to the specific sound-readings that you get when scanning over gold targets. These drills should be done with headphones. With some practice, you will start to be able to tell the difference between gold and other metallic sounds by the difference in the strength, crispness and tone of the signal. Stronger-reading metals will give a sharper and louder change in tone, whereas gold tends to cause a softer and more indistinct signal–especially when located in smaller amounts or at a distance. Do the drill and see for yourself. 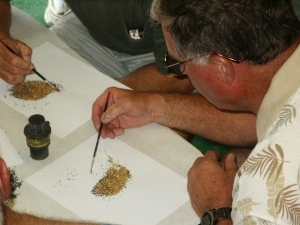 DRILL No.3: Using the flake-gold and nuggets in different accumulations, as done in drill No. 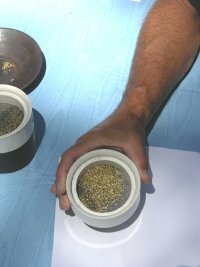 2, place the different sheets of mineralization over the top of the gold and note the responses on your metal detector. If you have a VLF, practice cancelling-out the mineralized sheets and test to see what size-accumulations of gold can be picked-up while doing so. Try more and more mineralization, combining the sheets together if necessary, to see how much mineralization your VLF detector will look through and still have sensitivity to gold targets. Notice how even a larger piece of gold puts out only an inkling of a reading when covered by heavy mineralization and/or scanned from a distance. Recognizing these very light signals is usually the difference between success and failure in electronic prospecting! 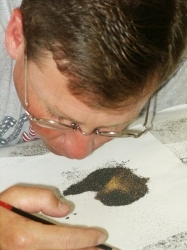 If you are doing these drills with a BFO detector, try combining different amounts of mineralization with the various-sized accumulations of gold. Determine for yourself on your own detector how much mineralization it takes to block-out the different accumulations of natural gold. I am certainly aware that sometimes it is difficult to come by a collection of gold flakes and nuggets if you don’t already have a collection of your own. 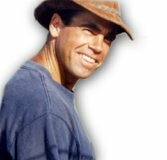 However, the time spent in locating some natural targets to practice with, or in talking a friend into lending you his collection–or in talking him into doing these drills with you—will be worth many times as much time spent out in the field with your detector. These drills will not teach you how to prospect for gold deposits. Only practice and experience out in the field will do that. But these drills will go a long way to familiarize you with your detector and give you certainty on the use of it. 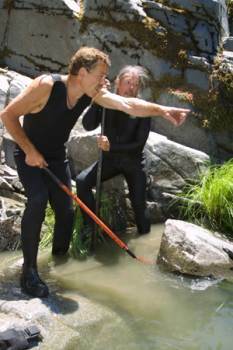 They will help you with the basics that you will need to learn to prospect for gold with a metal detector. Some manufacturers recommend that their volume-changing detectors be tuned to just below the hearing range. The purpose of this is so that the slightest reading will make a sound— which can be easily distinguished from the silence. But for prospecting purposes, it usually works better if you tune your detector so the audio signal is always within hearing-range. This will use up the batteries just a bit faster, but it is much better to be able to hear the signal at all times. The audio threshold (“threshold”) of a tone-difference sounding detector should also be set just in the hearing range. When looking for natural gold targets, just the slightest change can mean the difference of finding or missing a gold target. Changes in volume and/or audio tone also are an indication of changes in ground mineralization and let you know when adjustments are needed to ground-balance again and again. Sometimes the detector’s audio signal will drift off to a lower volume range due to temperature changes or loss of battery life. If the audio signal is tuned into the non-hearing zone and drifts into an even lower range, you might be scanning for several minutes without having the detector tuned properly. That would just be a waste of time. Sometimes a warming coil will cause the threshold sound to drift upwards. A cooling coil might cause the threshold to drift downward. Hunting in and out of water environments, while scanning the banks of a stream, might cause threshold changes. You should make adjustments as necessary. The main cause for a detector’s tuning to drift is loss of battery life. When this occurs, it is time to replace the batteries with a new set so you can get the best performance out of your detector—which is needed when hunting directly for gold. It is always a good idea to bring along an extra set of batteries into the field when prospecting. Because when they quit, you are finished until new batteries are installed. Extra batteries should be kept cool and dry. Zip-lock baggies work well for this. Prospecting for gold targets directly with a VLF detector should almost always be done in the “all-metal” mode. Setting Sensitivity: It is important to stress that you do not want to set the sensitivity too high on your VLF detector while prospecting in a heavily-mineralized area. A high sensitivity setting while testing a nugget in the air will show improved perception—and therefore can give you a false impression of the detector’s scanning ability for gold targets in the ground. It is better to do your settings while scanning over your test-nugget on the ground that you will be searching over. Turning the sensitivity up too high in mineralized ground is similar to using high-beam headlights in the fog. You get lots of flashback and irregular sounds and false targets. If your sensitivity is set too high, your detector will operate in an erratic manner. There will be many false signals which do not repeat themselves (“flashback”). Consequently, less sensitivity can give you more depth-penetration in mineralized ground. There is actually a middle ground, depending upon ground mineralization, which will give you optimum sensitivity without too many “ground noises” which are confusing and prevent you from selecting the real targets. Try and run with the sensitivity as high as possible—until the steady tone of the threshold begins to give off an uneven, wobbly sound while you are scanning. I usually do not recommend using the factory preset marks on your detector controls. Such settings are for average conditions. Prospecting for gold targets requires continuous adjustment to ground-balancing, and the threshold and sensitivity need to be set as accurately as possible to ever-changing conditions. You need to get the most possible out of your detector to avoid missing gold targets. “Peak Performance” on a metal detector for nugget hunting purposes in most cases is: maximum volume on detector, threshold set in minimum audio hearing range, maximum sensitivity without receiving too much flashback, and ground-balance to the average ground being scanned. When you accomplish peak performance on your detector, the rest is up to you! By this, I mean you will have to interpret which signals should be dug up. Ground-balancing: Setting the proper ground-balance on your detector, and keeping it properly adjusted while you search, is perhaps the most important factor in successful nugget hunting. I cannot overstate this point; because without proper ground-balance, you simply cannot find natural gold targets—unless you just get lucky. All of the skills we will talk about in this article, skills and methods which will make you good at finding gold targets, all depend upon your detector being properly ground-balanced. Always set your ground-balance to the average soil or material which you are searching. You will find the majority of gold nuggets in average ground. If you ground-balance to specialized heavier-mineralized zones which are not the average matrix, you may forfeit some depth-probing capability or sensitivity to smaller or deeper gold targets. Detectors which come with permanently-set, predetermined ground-balance are usually not especially good for electronic prospecting. You should hear a low hum when your detector is turned on properly (threshold sound). As the detector is raised or lowered from the ground, the threshold hum should get louder or softer. This tells you what needs to be done to get a proper ground-balance. Handling the ground-balance knob or button on your detector is similar to handling the volume control of a radio. If the threshold hum is disappearing as you lower the coil to the ground, turn the knob up. If the hum gets louder as you lower the coil, turn the knob down. The basic idea is to adjust the ground-balance knob (or press the button) until rising and lowering the coil to the ground creates little or no change in the threshold hum. Ground-balancing has to be redone on a regular basis while prospecting. The reason for this is because placer deposits do not contain uniform amounts of magnetic mineralization. Water-flows create low pressure zones and high pressure zones from one place to the next. These different zones accumulate different amounts of mineralization during flood storms. Often, you can see changes in mineralization just by noting changes in the color or surface of the ground you are scanning. Also, changing from gravel-like material to bedrock surfaces almost always changes the amount of ground mineralization. Get into the habit of re-ground-balancing about every 15 or 20 feet, or about every five minutes, or whenever the ground conditions change. Your detector will tell you what is going on. If the threshold hum is getting louder, it usually means there is less mineralization in the ground you are now searching. If the hum goes softer, the mineralization is increasing. With a little bit of experience, you will gain your own perception of when it is time to re-ground-balance. It is almost never a good idea to balance a detector over top of a piece of metal in the ground. Move around until you find a non-reading area to ground-balance. When ground-balancing, move your coil all the way down to touch the ground if possible. I say “if possible,” because you occasionally run across areas with so much mineralization that you are not able to put the coil within a few inches of the ground! “Alkali salts” in damp soil can sometimes also create so much interference that the coil of your detector needs to be raised several inches above the ground to search for targets. Naturally, depth penetration is lost by doing this. But sometimes you have no other choice. Sometimes you can also get around this problem by making adjustments to your detector’s sensitivity. This will allow you to search with your coil closer to the ground; but the reduced sensitivity will likely eliminate some perception of smaller or deeper gold targets. Sometimes, you can obtain better results by ground-balancing your detector a little on the positive side. A slight positive ground-balance increases the detector’s sensitivity to smaller gold targets when hunting in an area of lighter mineralization. This means that the threshold makes a slightly louder hum as the coil is lowered to the ground. When operating this way, be sure to keep the threshold in the audio hearing range. You don’t accomplish this by adjusting the threshold; reset the ground-balance as necessary to remain in the audio hearing range when lowering the coil to the ground. Just a slight positive ground-balance boost is all that is needed. Some experienced prospectors like to operate in a positive range all the time. However, you may find instances when working around highly irregular ground, vegetation and/or rocks when a slight positive ground-balance creates a problem. Lifting the coil up and down and around with a positive ground-balance setting can create a similar situation as with too much sensitivity. In highly-mineralized ground, when there are too many flashback signals which could be real targets, you can try ground-balancing your detector to a slightly negative setting with the coil on the ground. This may reduce your sensitivity to some of the smaller gold targets. But it is likely to settle-out your machine, and it might make it possible to locate targets which otherwise would not be accessible. Always bring along your small sample natural gold target (about the size of a match head). This should be glued to a bright colored poker chip, or something similar, to keep it from being lost. Some prospectors go so far as to drill a hole and tie a string to the poker chip to avoid losing valuable time searching for lost poker chips! When in doubt about your tuning, toss down the sample gold target, cover it over with the ground in question, and see how your detector reacts. It might not be necessary to cover the test-nugget. Just placing it on top of the ground may be enough to test the tuning of your detector over that type of ground. One thing which should be mentioned is that while you are searching around, your threshold hum is likely to change. 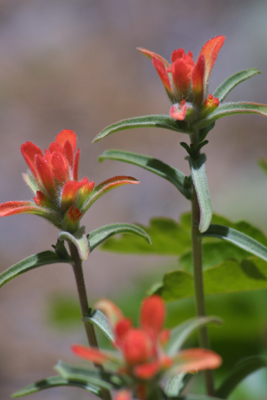 The answer is usually not to reset the threshold; it is to adjust ground-balance and sensitivity as necessary to challenge the changes in ground mineralization. Your sample gold target will be the final test of whether or not your adjustments are working. 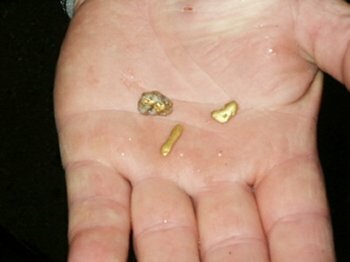 If you don’t have a small natural gold nugget, you really should get one! Otherwise, a small piece of lead will create a similar target. Other Tips on Tuning and Setting up a Metal Detector for Prospecting: When you are operating a metal detector, it is good practice to remove all rings, bracelets, watches and other jewelry from your hands and arms (ankles and toes). They can give a false read on the detector. This is especially true when you are testing a detector before buying, or when you are tuning your detector to sound-out properly on a special metal target while passing it over or under the search coil with your hand. Sometimes, belt buckles, canteens, knives and other digging tools or large metal objects carried on a belt can create false signals when using the more sensitive and specialized gold detectors. Even metallic eyelets on boots can cause problems when scanning too close to your feet. It doesn’t take much practice to figure out how to solve these problems. Make sure to adjust the shaft-length on your detector to a comfortable position. Bending over too far will create uncomfortable back strain when hunting for extended periods. Also, when the angle of the search coil on the shaft is changed to fit a new set of search conditions, the detector must always be re-tuned to correspond with the new relationship between the coil and the metal shaft. Some prospectors prefer to mount the control box of their detector on their belt or hip. This lightens the arm-load during longer periods of prospecting activity. It is also a good idea to wind the coil connection cable firmly to the shaft. This way, it is not flopping around, giving false signals or getting caught on objects and vegetation. Be careful not to pull the cable so tight as to break inner wires and create irregular operation of the detector. If you are looking over a metal detector you are interested in buying, test it to make sure that its tuning does not drift on its own. This test can be done by placing a good set of batteries into the device, turning it on, allowing it to warm up for a minute, tuning it in, and allowing it to sit and run for 5-to-10 minutes. If the audio tone drifts during this time, you ought to look around for a similar detector which has better electronic stability. CAUTION: Wetness and dampness are not good for the control box of any type of electronic detector. Be careful to avoid getting yours wet when working around water. If you intend to use a detector out in the field on a damp or rainy day, you can cover the control box with a clear, loose-fitting plastic bag and secure it to the shaft of the detector. The bag should be loose enough so you can work the various control knobs without having to untie the bag and take it off to setup or re-tune the detector. It is important in electronic prospecting to use quality headphones. This point cannot be over emphasized. Some detectors work just fine with the headphones which come from the factory. There are different types of headphones. Some are heavy and cover the ears thoroughly. Some are light. What is best for you will depend largely upon the conditions where you are going to search. For example, the heavy type which thoroughly covers the ears might not be very practical in the hot, quiet desert environment. But they might work exceptionally well in a cooler environment—say along the bed of a creek where running water is making lots of background noise. Areas which include the company of occasional rattlesnakes might require the use of lighter, less sound-proofed headphones! The proper headphones for a specific hunting environment are another area where the local dealer or members of the local prospecting club can make valuable suggestions. It is a common practice for prospectors to shorten the length of cable on detector headphones to about 3 1/2 feet. This helps prevent the cable from snagging on branches and other obstructions when working in brushy areas or climbing over uneven terrain. Some detectors have volume controls and others do not. Volume on a detector while prospecting should normally be turned to maximum. Don’t confuse this with threshold hum, which should be set near minimum audio level. If maximum volume on the detector is uncomfortable to you, obtain a set of headphones which have volume control. Then, turn your detector’s volume all the way up and use the headphone controls to turn the volume down if you must. Many electronic prospectors highly recommend “sensitivity enhancers”—like those made by DEPTHMASTER. These help enhance the soft target sounds from gold, while lessening the noisier signals caused by trash and iron targets. A plastic cup or tray is sometimes necessary to recover gold targets, even in dry terrain. A plastic gold pan is helpful to work down material where water is present. Sometimes a portable garden rake is helpful for moving smaller rocks and obstructions away from a productive hunting area. A small G.I. shovel is helpful in some hunting environments. A canteen filled with liquid; tweezers, needle-nose pliers for removing gold from bedrock traps; and a small pick for digging and scraping. Sometimes the ground can be very hard. This is especially true when finding gold on hard caliche layers in the desert. A wide belt with a carpenter’s loop (for holding hammers) comes in very handy for a small pick. This keeps it out of the way, but also makes it quickly accessible. A lot of your gear can be left at your vehicle, or carried in a backpack which can be set down at the hunt site. It is usually better to not load yourself down too heavy while prospecting with a metal detector. Many electronic prospectors are using empty 35mm film containers to contain recovered gold targets. These are unbreakable, and the large mouth makes it easy to get a piece of gold inside. Zip-lock baggies are also helpful. A magnet can be a very big help while electronic prospecting. Sometimes you can recover a faint-reading iron target right out of the dirt with a pass of a magnet. Otherwise, you might find yourself losing valuable minutes picking through the material, looking for a small piece of gold. Animal feed stores commonly stock a special magnet used for cows (traps small iron particles, preventing them from entering and damaging intestines). These magnets are powerful, yet inexpensive. You can mount one on the end of your small digging-pick or tape it to the handle of a plastic or stainless steel garden trowel. This way, the magnet is handy when you need it. Some prospecting picks are available which already have a magnet attached; very convenient! A serrated-edge on a garden trowel also is helpful when you find yourself digging around roots or brush. Some prospectors keep one edge of their trowel sharpened just for this reason. When working bedrock areas, a small crevice tool can be a big help to open cracks and crevices which are sounding-out on your detector. Some kind of pouch or pocket creates a location to dispose of small pieces of trash and iron which you dig up. You only want to dig it up once! It is much better to remove all small trash targets from the playing field. With the continuous improvement of electronic prospecting tools, you could find yourself going back over the same areas again at a later time! Some prospectors are using fishing or photography vests—lots of pockets. These come lightweight or heavy, depending upon the environment where you plan to hunt. BY ANTHONY “LITTLE TONY” STEURY, SR.
As usual, I awoke to the sound of a mother osprey’s loving shrieks giving instructions to her two young ones who had not yet mastered the art of flight. The sun was just coming over the top of Sugarloaf Mountain, quickly cutting the chill from the night air. I could tell by the thundering sound of the rapids below my camp that the mighty Klamath River was rising at an alarming rate. The flood gates at the dam were being slowly raised, and I knew my time was limited. 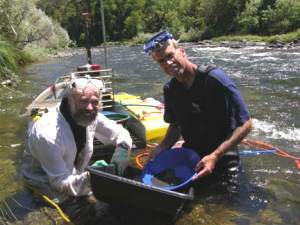 I felt that I must get down to bedrock under the rapids in order to find the gold that I knew had been waiting there for a gold dredger with modern equipment since the earth was formed millions of years ago. As I quickly prepared a hot breakfast to help brace myself for the cold water I would have to endure, I reflected on the past two weeks dredging with my 6-inch dredge slowly moving yards of material, throwing cobbles, and moving small boulders to bore my way down to bedrock and get deep enough to escape the white water force that kept blowing me out of the hole. I was now at a point where most of the turbulence went over the top of my head, and I no longer had to work on my stomach with my face next to the nozzle intake to see. When I first started this hole, I was using 85 pounds of lead around my waist. One slight turn of the head would mean getting my mask or regulator ripped from my face by the turbulent force of the rapids. I was snapped out of my interlude by the smell of burning bacon and a beautiful eagle gliding gracefully up the river taking full advantage of the thermal river canyon updrafts. Had I known then what events waited for me at the bottom of the river this day, I would have stayed in camp and dreamed of all the gold I had found in the years past. As I put on my wet suit, my dog “Treasure” was already in the truck patiently waiting to go to our dredging operation as she had done so many times before. I think she knew our time was running out, and swimming the river to work our claim would soon be impossible. I finished suiting up and grabbed all my gear. Twenty minutes later we were at the dredge, gassing up and getting ready to dive. I took a quick look at my water marker, and it showed that the water had progressed 18 inches higher since yesterday. Not a good sign in the life of a fast-water dredger. Just as I started my engine and was preparing to slide down the suction hose into my hole, an ominous black cloud came from nowhere and totally blocked out the sun. It gave me a strange feeling as I looked up the side of the mountain and saw the old growth trees bending to a heavy wind by its awesome power. The cold, fast water slammed into my body. As usual, my gallery was waiting for me in the bottom of the hole. Two ugly eels, three big suckers and many small fingerlings. Without the sun, and because of a heavy flow of algae, it made visibility less then ten inches. I grabbed the nozzle and started plowing my way deeper around the base of a large boulder that I knew was lying on bedrock. Every day I had tried to move it with an 8-foot pry bar without success. “Today,” I vowed it would move. 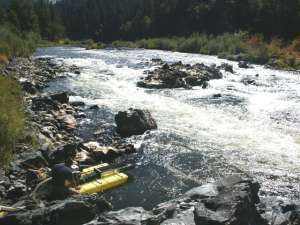 I threw caution to the wind and felt if I moved enough overburden from around its base, the force of the water would drop it on down behind me to the bottom tier of the rapids. After steadily working for an hour and a half, I took a quick look at my watch and saw I had ten minutes of gas left. I was just about to go up and refill when the sun came from behind the clouds, allowing me to see that I had finally reached bedrock. There was a one-inch crevice starting at the base of the boulder making it a natural riffle. I took my small pry bar from my belt and pried into the crevice. Yes, I was right! Out came the gold into my suction nozzle. I had found the paystreak; I had outsmarted Mother Nature once again. Just as I turned to go up and refill the gas tank on my dredge, I heard the familiar grinding sound of falling rock. A breathtaking pain shot up my leg causing me to spin around and grab my calf. As I did so, my mask and regulator were torn from my face. Experienced reflex made me grab my air hose to quickly retrieve my air source which I shoved back into my mouth, blowing out the water so I could breath God’s clean fresh air again. At this point, after diving rivers and lakes clear back to when I was a young boy, I still panicked, causing me to hyperventilate. My mind started spinning to warn me I was about to black out. From out of nowhere, a voice was telling me to slow down my breathing, lie still and think things out before I became another one of the river’s many victims. As my mind cleared, I started to run my hand down my leg, since without my mask, I could see only a few inches in front of my face. As I did so, again came the full force of pain which I was now more prepared for. After a quick search, my hand told me my ankle and foot were pinned under the large boulder that I had released with my foolish dredging around its base. I lay back again waiting for the pain to subside. Fighting panic, which would only bring me death, I took off one of my gloves and started to feel around behind me knowing my 8-foot steel bar lay somewhere near-hopefully close within my reach. It was the only chance of freeing myself, and a slim one at that. After groping around as far as I could reach, I was about to give up when my fingers touched steel. I arched my back and got three fingers around the point. Grabbing it the best I could, with my leg killing me, I pulled it toward me far enough to get a better grip and have total control. Just as I got it under and behind the boulder, I heard the engine stop from above. I knew that there were only fifty-two seconds of air left in my holding tank. I twisted my body allowing me to put my unpinned leg against the boulder while, with arms above my head, I grabbed the top of the bar with both hands. I knew there would be only enough air for one chance to free myself. My mind raced back through my past. I thought of all the sporting events I had won in my youth. All the brave men who had died for their country telling me of all the things they still wished they could do. My family who still needs me and all of life’s battles I had won. I felt a surge of power entering my body along with that gut feeling one always gets just before a win. I sucked in the last remaining air in my tank, pushing with my leg and pulling down on the bar with the 180 pounds of power that my body had to give. Instantly, I fe1t the boulder move and I wrenched my leg free. Without hesitation, I ripped open my lead weight buckle release and shot out of the hole and down the rapids at breakneck speed. In times past, this trip would mean a one-mile walk back up the river along a very rugged river bank, plus a one-hour delay swimming back across the river, floating down to my dredge, and retrieving all the gear I was forced to drop. This day as my body was bounced along the bottom and slammed into boulders, I felt only the breath of joy while thanking a power greater than myself for this gift of life that was once again given to a mortal such as I. 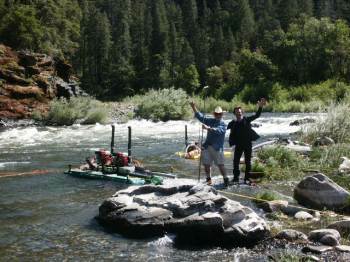 In a matter of minutes, my high-speed float trip was over, after being hurled into a slow water eddy which allowed me to drag myself up on a pile of cobblestones left by the old-time 49’ers. As I laid back, totally exhausted from the pain and nerve-wracking experience, thinking about the fantastic gold deposit I had located, I looked up into the sky just in time to see my friend the eagle drop a wing tip to catch another updraft. He was, as always, looking after me and all of those who respect and love the river, saying farewell until another day dawned fresh in the life of the fast-water dredger. 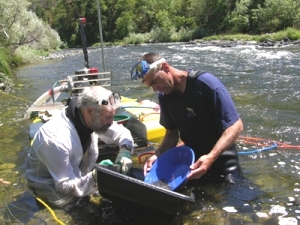 More commonly these days, a dredger only cleans-up the “high-grade” section of riffles in his or her dredge after each sample or at the end of a production day. That is a special small section of riffles which catch most of the gold near the head of the sluice. The full recovery system is usually only cleaned-up when enough gold has accumulated to make the effort worthwhile, or it is time to take the dredge out of the water. After a sluice box has been run for an extended period of time without being cleaned, the riffles will be substantially concentrated with heavy materials behind them. Sometimes an abundance of heavily-concentrated material in a sluice box can reduce the efficiency of the riffles. This is not always the case. Much depends upon the type of riffles being used and how they are set up in the box. The true test of when a set of riffles is losing its efficiency because of being loaded down with heavy concentrates is when an important amount of gold starts being trapped further down the length of the box than where it normally catches. When this occurs, it is definitely time to clean up your box. Otherwise, clean the box when you like. Expanded-metal riffles, being short, will tend to load up with heavy black sands faster than the larger types of riffles. Still, a large, visible amount of black sand being present is not necessarily a sign that you are losing gold. Gold is about four times heavier than black sand. As long as there remains fluid action behind the riffles, the black sand might have little or no effect upon gold recovery. The best way to evaluate your recovery system is by direct observation of where the gold is being trapped. 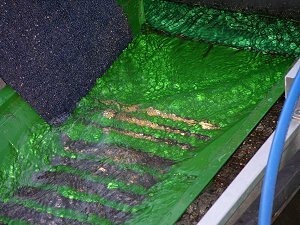 The concentrates which have accumulated in a sluice box can be removed by unsnapping the riffles, carefully removing the carpet underlay, and washing everything into a washtub or bucket. The contents can easily be rinsed out of the carpet underlay inside the washtub. A medium-wide plastic putty knife can be very helpful in removing lingering concentrates from the high-grade section of a sluice box when that is the only place in the recovery system being cleaned-up. Or, rather than use a special device (wheel, bowl, etc), you can work your concentrates completely or nearly down to the gold with the use of a gold pan. In this case, I would suggest that you first classify the material through 8-mesh (8 openings per linear inch) and then through 20 mesh (20 openings per linear inch) screens to break it up into three sizes: 1) the material which stays on top of the 8-mesh screen; 2) the material which passes through the 8-mesh screen but stays on top of the 20-mesh screen; 3) and the material which passes through the 20-mesh screen. I have thoroughly demonstrated the panning process in a separate article, so I won’t repeat that here. Important: Before you do the first step of this process, it is best to work your concentrates down as far as possible, to remove all of the black sands that you possibly can. The more black sand you can remove while the material is wet, the less you have to deal with after it is dried. Sometimes you can remove more black sand with the careful use of a finishing pan (small steel gold pan about 6-inches in diameter) inside of a small wash tub. A Gold Extractor will allow you to work all of your gold down with no loss, and only about a tablespoon of black sands remaining. STEP 1: First dry out your final concentrates. This can be accomplished by pouring them into a small metal pan (finishing pan is best) and slowly heating them over an open fire or gas stove-whichever is at hand. STEP 3: Take the larger-sized concentrates (the material which would not pass through the window screen), and pour them onto a clean piece of paper. If there is a lot of this sized concentrate, this step will have to be done in stages, handling a little at a time. Once the concentrates are poured onto the paper, it is easy to separate the pieces of gold from the impurities. The impurities should be swept off the paper and the gold should be poured into a gold sample bottle. This is where a funnel comes in handy. STEP 4: Once the larger-sized concentrates have been separated, the remaining concentrates can be classified through a finer-mesh screen. A stainless steel, fine tea strainer (about 20-mesh) works well for this. Tea strainers can be found in just about any grocery store. STEP 5: Take the larger classification of concentrates from the second screening, pour them onto a clean sheet of paper, and separate the gold from the impurities in the same way that it was done with the larger material in Step 3 above. Use of a magnet on each size-classification of concentrates can be very helpful to remove those impurities which are magnetic. Some prefer to use a fine painter’s brush to separate out the non-magnetic impurities. Separation can also be accomplished by using your fingers. This step goes faster if you only do small amounts of concentrate at a time. Pour the gold recovered in this step into the gold sample bottle. 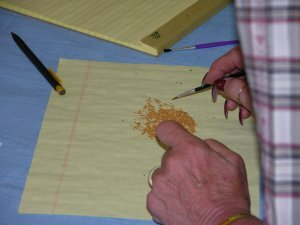 STEP 6: Take the fine concentrates which passed through the final screening and spread them out over a clean sheet of paper. Use a magnet to separate the magnetic black sands from these final concentrates. The magnetic black sands should be dropped onto another sheet of clean paper, spread out, and then gone through with the magnet at least one more time. The reason for this is that some gold can be carried off with the magnetic black sands. They tend to clump together. Once the magnetic black sands have been thoroughly separated from the gold to your satisfaction, pour them into your black sand collection. There may still be some small gold values left with them which can be recovered by other methods at another time. NOTE: There is a really nice set of final clean-up screens on the market that are made just for the purpose of separating your final concentrates into the ideal size-fractions for final dry separation. I highly recommend them, because they separate your final material into multiple size classifications which make the final dry process go even faster. STEP 7: Now, all that should be left is your fine gold, possibly some platinum, and a small amount of non-magnetic black sand. These final black sands can be separated by blowing lightly over them while vibrating the sheet of paper. Since the sand is about 4 times lighter than the gold, it will blow off the paper a little at a time, leaving the gold behind. Once all the black sands are gone, you can pick out the pieces of platinum if present, and separate them from the gold. Pour the gold into the same gold sample jar used in the earlier steps. This dry process (Steps 1-7) goes very quickly if an effort was made during the final wet stages to get as much black sand and other waste material as possible separated from the gold. Sometimes, gold will come out of a streambed with some impurities attached to it. When this happens, it will be necessary to perform a final cleaning process to make the gold’s natural beauty stand out. If your gold is not clean and shiny, and you want to get it that way, place it in a small non-breakable water-tight jar about half full of water and add a little dishwashing liquid. It does not seem to matter what kind is used. Fasten the top on the jar and shake the contents vigorously until the gold changes to somewhat of an unnatural glittery color. Sometimes this happens quickly and sometimes it takes a little longer. This mostly depends upon how much gold is in the jar. The more gold, the faster the process. This is because it is the friction of gold against gold which facilitates the cleaning process. Once the gold is glittery, rinse the soapy water out of the jar, pour the gold into a small (metal) finishing pan, and heat it up (outside and down wind) until the gold takes on a deep, natural, shiny luster. It is important to make sure that all of the soap has been rinsed away from the gold using clean water before you dry the gold. Gold has a tendency to turn a dull color after having been stored in an airtight container for an extended period of time. For this reason, some gold miners and dealers store their gold in water-filled jars, and dry it out just before displaying it or making a sale. If you should happen to store your gold in an airtight container and notice that its color does not seem to be as bright as it once was, wash it with soap and water and re-heat it, as in the above steps. This process will bring back the beautiful color and luster of the gold. The best time to weigh your gold to get the most accurate measurement is after you have completed all of the final cleanup steps. There are numerous markets where you can sell your gold. Refineries will pay you for the fineness (purity) of the gold itself and subtract a few percent for refining charges. In this case, you will receive a little less than the actual value of the gold. 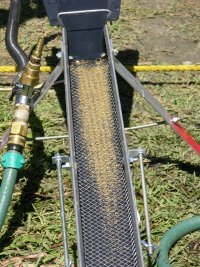 Refineries usually will not pay for the silver and platinum contained within your placer gold unless you are delivering it in large quantities. Refineries prefer that you bring your gold to them in large amounts. They will often charge less for refining, and sometimes pay just a bit more for the gold, when it is brought to them in larger quantities. Flakes of gold and nuggets have jewelry value on a different market. If marketed to the right buyers, flakes and nuggets can usually bring in more than a refinery will pay-or sometimes even much more. 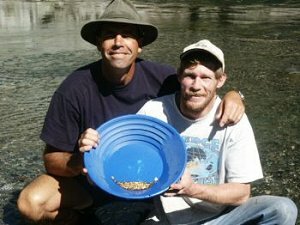 If you are in gold country and ask around, you can nearly always find someone who is buying placer gold from the local miners. These individuals usually pay cash. Unless the fineness of the gold within the area is lower than normal, there is no reason to settle for less than 70% of the market-value of the gold for that day. This means that the gold is weighed and the buyer pays you for the weight of what you deliver. Impurities are never calculated into this type of deal. If you enquire around, you can usually find someone who is willing to pay 75% of weight. Sometimes you can find an 80% straight-out buyer-which is good. There are also people out there who are ready to gyp you out of your gold if they can get away with it. It is wise to bring your own pocket calculator along when dealing with a new buyer. If you go to a dealer who starts figuring a certain percentage of the fineness, and his final figures end up lower than a straight out 70% of the bulk weight of your gold as it is, go find another dealer. This is not to say that 70% is the going rate. You can do better if you look around. Although, you should never have to accept less than 70% of the going market price for your gold. If a dealer starts to tell you all sorts of reasons why your gold is not worth what you want for it, go find someone else. There are plenty of gold buyers around who will at least admire your gold. So there is no reason to hang around and listen to someone who is trying to steal it from you. Local miners will know who pays the most! Or go up on our web forum and ask. Someone there is sure to turn you onto a good deal! 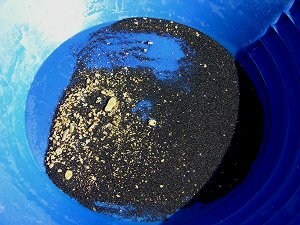 Cleaning your gold well before you take it somewhere to be sold can help a lot. Sometimes dentists will give you a good price for your gold, and a phone call or two can pay off. Also, some lawyers and businessmen like to invest in gold. Sometimes you can get up to 100% of spot for your fines (fine gold) when dealing with them. Some jewelers will pay well for your flakes when they have a demand for them. It is not uncommon to get as much as 90% or better when you make such contacts. The best way to get top dollar for your gold is to do a lot of inquiring, always with the intention to find more and better markets. Then, when you need some cash, you can sell to the buyer who pays the most. Getting Your Dredging Equipment Ready for the Season. 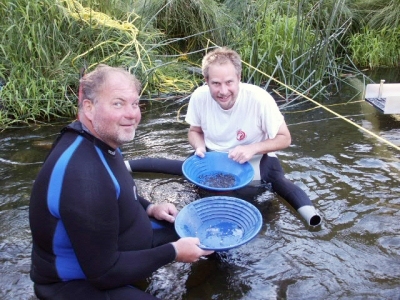 It is common to find rich gold deposits in shallow streambed material out under the fast water where nobody has ever ventured before! Something we have known for quite some time is that pay-streaks, often very rich pay-streaks, exist in the fast water. 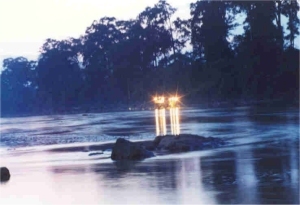 At first, this may seem contra­dictory to our general understanding that high-grade gold deposits form in areas of the waterway where the water slows down. However, we must keep in mind that pay-streaks are created during major floods. During a major flood, a sudden drop in the bedrock can cause a very good gold trap, like the riffles in a sluice box, but on a very large scale. If you turn on a garden hose at slow speed, the fast-water area is found directly where the water flows out of the hose. But when you turn the water-pressure up, momentum forces the water farther out. This condition also occurs within the river during a major flood. Areas where the water runs fast during low-water periods are likely to be drop-zones for gold during high water. The heavy momentum/velocity area will be forced farther downstream, leaving a drop-zone for gold just below the bedrock drop. 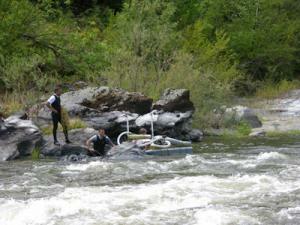 This explains why you can often find pay-streaks under rapids when the river is flowing at low-water levels. It also explains why you seldom find pay-streaks within the first slow-water area below a set of rapids when the river is running at low levels. 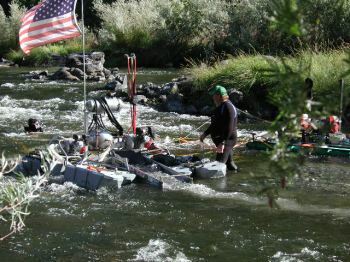 Another reason why you are likely to find gold in fast water is because dredging in fast water is more difficult. Therefore, others are less likely to have mined there before you – including the old-timers. For this reason, fast-water areas can often be virgin territory — meaning places where the original streambed material remains in place from thousands of years of natural geologic activity. What exactly is “fast water?” This depends upon each individual person’s viewpoint. It is primarily a matter of the diver’s comfort level. To some people, if the water is moving at all, it is already too fast to dredge. Other dredgers are able to dredge in water moving so fast that the air bubbles created by the turbulence eliminate all visibility. After diving in really turbulent water, a person’s equilibrium can become so disoriented that he/she can hardly stand up without weaving around, as if intoxicated. 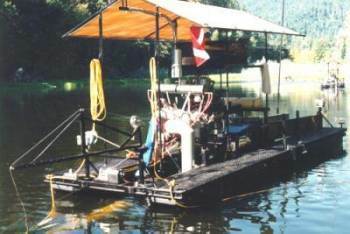 Several years ago, a friend and I were operating a five-inch dredge in some very fast, shallow water. Because of the extreme turbulence, one of us would work the nozzle, while the other would hold onto the dredge to keep it from flipping over. The water was so swift that my friend was swept out of the dredge hole time after time. Once, he was carried away so fast, he didn’t have time to untangle himself from his air line before he reached the end of it. The air line was tangled around his neck! There he was, flopping around in the current, like a flag snapping in a stiff breeze, tethered by the air line around his neck and struggling, unsuccessfully, to regain his footing in three feet of water. After he got safely to the bank, we both laughed so hard that tears were streaming down our faces. That was emotional stress blowing off. Fifteen minutes later, I was the one bouncing in the current behind the dredge, facing backwards at the end of an air line caught between my legs. Needless to say, my friend thought this was pretty funny, too! 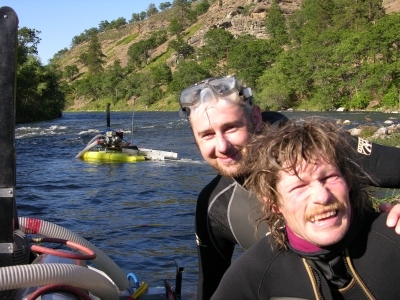 Dredging in fast water can be fun and exciting (not to mention the gold you can find). But, you must be aware of and prepared for the dangers involved. There is very little margin for error if you get into a situation that is beyond your ability to manage. We all have our limits! Notwithstanding all the excitement and gold, safety should always be the most important personal consideration. You are the one out there in the field with the responsibility for using good judgment about what you can safely do, without cutting your margin for error too close. The river does not have any sympathy for people who “get in over their heads.” I’ve known several dredgers who lost their lives by over-stepping their personal safety boundaries. It only takes a single mistake. The rest can happen very quickly. Even I have come close to drowning on more than one occasion! All the gold in the world is not worth dying over! For the sake of safety, it makes good sense for you to not dredge in water that is faster than you are comfortable with. You will have to decide what that is. It is best to practice first in slower water, to gain experience and confidence. One important thing you should remember about working underwater: Everything may be calm and under control right now; but five seconds later, you can find yourself in the most life-threatening emergency you have ever experienced! This is even true in slow water. But, fast water gives you less margin for safety if you make an error or anything goes wrong. 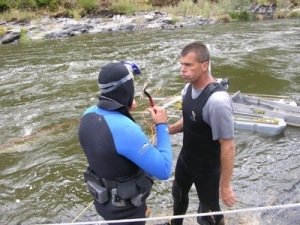 You should not dredge in fast water if you are unable to control the various problem-situations that could develop. You need to anticipate each problem that could possibly arise and work out your response, in advance. Contrary to what many people believe, being swept down river by the current is not the major concern. This is a normal-happening in fast-water dredging. As long as you have your mask clear and your regulator in your mouth, being swept down river by the current is generally no big deal. That is, of course, unless you are dredging directly above a set of falls or extremely fast water. In most cases, the “fast water” you are in is not a steady flow of current. It is usually turbulent, varying in direction and intensity. A swirl can hit you from the side and knock you off balance. Or, sometimes it can even hit you from underneath and lift you out of the dredge-hole and into the faster flow. If you get swept down river in fast water, you usually just need to grab hold of the river bottom and work your way over to the slower water, nearer to the stream bank. 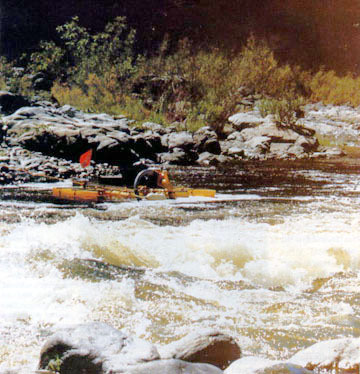 This movement is normally best-done by continuing to face upstream, into the current, while you point your head and upper-body towards the river-bottom. That posture will nearly always drive you to the bottom where you can get a handhold on rocks or cobbles to anchor yourself down. 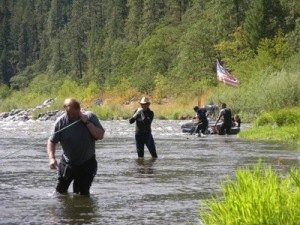 Then, you can work your way upstream, through the more slack current near the stream bank, and back out to your work-site again. This is all pretty routine in fast-water dredging. Getting a hole started is one of the most difficult challenges in fast-water dredging. Once you even get just a small hole started into the surface of the streambed, the suction nozzle in the hole can serve as an anchor to help hold you there against the current. There will also be several cobbles behind you to use as footholds, which also make it easier to hold a position there. After the hole has been expanded to the point where you can get at least part of your body inside, you will find significant relief from the effects of the current’s flow. But, it can sometimes be a real challenge until you do get to that point! At times, you may find it necessary to start your hole in slower water, then gradually work your way out into the faster current. One of the main concerns when dredging in fast water is having your mask and/or your regulator swept or knocked off your face. This situation is one that can cause a person to panic, especially when both mask (vision) and regulator (air) are lost at the same time. There is not a single a person among us who won’t panic, given the right (wrong) situation. People who say they will never panic under any circumstances are just not facing reality and, obviously, have never come close to drowning. I believe it is better to understand and acknowledge your limitations before you get into trouble. The closer you cut your safety margin on safety issues, the more aware of your limitations you should be. And, the more important it is to plan in advance how you will react to certain types of emergencies. It is already too late to make such plans the moment something bad happens! For me, it takes a lot of personal discipline to stay under control when an unexpected rush of turbulent water jerks my mask off and drags me, blindly and chaotically, down river. This has happened to me on several occasions. I know that under those circumstances, it would not take much more confusion (e.g., air line getting snagged, my body being banged against something, losing my balance, getting a breath full of water from my regulator, etc…) for me to totally lose control and freak out (panic). I have worked with several guys who have a higher tolerance from panic in the water than I do. And, I know others who feel panicky as soon as they put their heads underwater, even under perfectly-controlled conditions. We are all different, and we each have our own particular point at which we will panic in different circumstances. Everyone has a limit. These limits can actually change from day-to-day, depending upon what other things are happening in our lives. It is better that we not delude ourselves about this. If you allow yourself to get overly-confident, and continually put yourself into situations that can take you beyond your limit, sooner or later you will almost-certainly find yourself tested in a life or death situation. Panic is a survival-mechanism that takes over when your mind is convinced that your life is in grave danger. At this point, your animal instincts take charge and deprive your intellect of the ability to reason things out. Panic tells you that there is no time left, that you are literally fighting for life just before unconsciousness. The situation demands that you spend your last/maximum physical effort to remove yourself from the danger that is about to mortally injure you or cause you to lose your life. Panic is a horrible, terrifying, and, sometimes, embarrassing experience that happens when your normal, rational self loses control, and the animal-part of you takes over. There are milder versions of panic. Someone might “panic” and do something silly or foolish in a business or a personal setting. That is not the type of panic that I am talking about here. I’m talking about the raw physical panic that grips you at the moment you realize you may be at the point of losing your life. There is always a chance of getting into serious trouble any time you are working under the water. Trouble underwater is serious because humans cannot breathe water. There is no margin. You are either breathing air or you are not. It is an immediate emergency when there is no air. Such emergencies can happen in a split second, any time you are in a dredging environment. Other types of underwater vulnerabilities are especially present during fast-water dredging activity. Some of this vulnerability is because it is sometimes necessary to weigh yourself down more-heavily with lead weights to stay on the river bottom. Extra weight is needed to give you the necessary stability and leverage to control the suction hose and nozzle and to move rocks and obstacles out of your way. The demands of dredging activity require divers to be so heavily weighted down, that it is impossible to swim at the surface without first discarding the weights that hold you to the bottom. When working in fast water, all of your normal safety precautions, preventative maintenance measures, and common sense instincts must be scrupulously observed. Fast water may be thought of as a liquid flow of energy that is constantly challenging you and your equipment. Murphy’s Law (“anything that can go wrong, will go wrong”) is always at work in fast water. It is hard enough to deal with the things that you cannot anticipate will happen. You will have enough of these as it is. But, if you neglect to take action with respect to those things that you can reasonably expect to go wrong, you will almost certainly fail in your efforts to dredge in fast water. If it is wrong, fix it now, before it gets worse! My dredging partners and I have found that it is physically possible to dredge in water that is too fast for the safety of our dredge — even the kind of dredge that has been designed for fast water. Therefore, the need to operate in an environment that is safe for your dredge is one of the major limiting factors in fast-water dredging. Most fast-water dredgers add more flotation to their dredge platforms to give more stability. This can be done in different ways, including additional pontoons, inflated tire inner tubes, PVC pipe material, Styrofoam, etc. 1) The fast-water current puts more strain on your dredge, frame, and tie-off lines. 2) More importantly, the surface-tension caused by all that additional water dragging around the dredge makes it difficult to work near the dredge when you are in the water (which can be a particular problem when you are trying to knock out plug-ups from the suction hose near the dredge). Another goal when adding flotation is to keep the floats as narrow as possible. A wide set of floats is more likely to be tossed or dragged around by the turbulent flow of fast water. 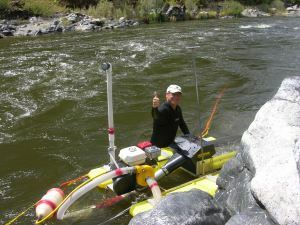 Generally, when working in fast water, I try to find a location for the dredge where the water is a bit slower, just next to the fast water where I plan to work. This way, I can enter the river in slower water and work my way out underneath the faster water, adding suction hose as necessary. Otherwise, if we position the dredge directly in the fast water, it will become necessary for the divers to contend with fast water when entering the water from the dredge. This can be done; but it makes the operation more difficult – especially, when the dredgers need to climb back onto the dredge. Also, the buildup of cobbles and tailings near the dredge can add to the surface-tension and create an even faster current flow under and around the dredge. When you are set up with the dredge positioned off to the side in some pocket of slower water, your suction hose will be running perpendicular, at least to some degree, to the flow of the fast water. That much hose exposed broadside to the current creates enormous drag, which can cause the suction hose to kink usually within a foot or so of where it attaches to your power jet. Hose-kinks will cause continuous plug-up problems, so they must be avoided. Therefore, you may find it necessary to disconnect the suction hose and cut off the section that has been kinked. However, you cannot shorten your suction hose very much before you lose the amount of operational flexibility you need for freedom of movement while dredging. Suction-hose kinks can usually be avoided by setting up a special harness to support the hose in fast water. This is often done by rigging one or two extra ropes down from your main tie-off line. The ropes are fastened to the suction hose at points which will allow the hose to be flexed back by the current, but not to the critical kinking point. You must allow the hose to flex back. It is the bend in the suction hose which allows you the movement to expand the size of your dredge hole. It is best, when rigging a fast-water harness, to rig it in conjunction with your main dredge tie-off line. This way, the entire dredge and suction-hose harness will move together, as a unit, when you need to move the equipment forward as your dredge-hole progresses. Suction hose support booms are standard equipment on the commercial Pro-Mack dredges. Larger and commercial dredges may be equipped with booms, which can be extended out in front and used to secure a suction-hose safety harness. In this manner, when the dredge moves forward, the suction-hose safety harness moves with it, as in the situation above. Another concern in fast-water dredging is to keep your suction nozzle and hose from being swept out of your dredge hole. Sometimes, the current will put so much drag on the suction hose that it takes all of your strength and energy to get any nozzle-work done at all! In such a case, you can relieve the main strain of the drag by tying a section of the suction hose to a large rock at the rear of the dredge hole or some other anchor point further upstream. When doing this, always leave enough slack in the hose to allow you to move the suction nozzle forward as your dredge-hole progresses. Also, be sure to remember to untie the suction hose from the river-bottom before you move the dredge. Otherwise, you can damage the hose by causing kinks in the middle! If you kink the hose in the middle, you will have to replace the hose! We have also worked out a way to extend the suction hose, swing it out on a pendulum line, and anchor it in place using a spare weight belt. This method nearly eliminates all of the hose drag for the person managing the nozzle. When you take a lunch-break or knock off for the day, you can anchor your hose and nozzle by either piling rocks on the suction nozzle or by tying the nozzle to a large rock in the bottom of the dredge hole. 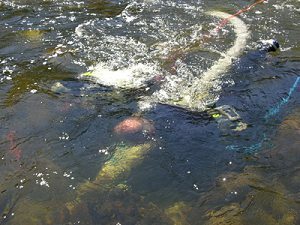 It is not any fun to start a production-dive by having to work against the current to get your suction hose back up into your dredge hole, because the fast water blew it out after your previous dive. But, of course, all fast-water dredgers get many chances to experience this. It is a normal part of the routine! One important safety point: When using ropes underwater, it is a bad idea to use any more than is absolutely necessary. A lose rope is poison to divers underwater, especially in swift water! Always cut off any excess rope or pile rocks on top to hold it down. If there is a length of loose rope flopping around in the current, something (like your air line) always seems to get tangled in it. Loose rope under water is dangerous! 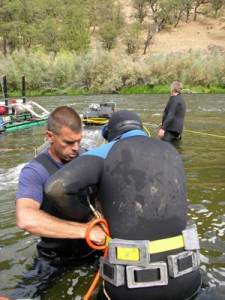 Your air line can be another source of problems when dredging in fast water. Always be sure to get all the loops out of your air line before starting your dive. Otherwise, the current can pull these loops into kinks, which can immediately cut off your air supply. Not fun! When you turn around in your dredge hole to roll boulders, toss cobbles, or do any of the many other things associated with production dredging or sampling, get into the habit of exactly reversing your turn when you face forward again (turning back counterclockwise is “cancelled out” by turning forward clockwise). This practice will help prevent you from putting lots of loops in your air line during the course of the dive. Each loop is a potential kink that can cut off your air supply in fast water. Each loop also increases the amount of drag being brought to bear on your air line in fast water. If you should get a kink in your air line that cuts off your air supply, you can usually get some immediate relief by pulling your air line in toward your body and letting it go. When you let it go, the pressure is temporarily removed from the kink, and you can usually get a single breath of air. I always try this once, quickly, when my own air is suddenly cut off. If that does not give me immediate relief, I crawl right over to the surface so I can properly correct the problem. If you are experiencing any difficulty with a kinking air line, your best course of action is to immediately remove every single loop in the line. Getting rid of the loops will require you to rotate yourself in circles, going in the appropriate direction, until the air line is straight again. Several years ago, I was dredging in fast water with a guy who had to repeatedly dive out of our dredge hole because of a kinking air line. After about the fifth time, I suggested that he take the time to straighten out his air line to fix this problem. This remedy only worked for a short time, because he had developed the habit of turning around and around in the dredge hole as he was moving rocks, which just created more and more loops in his line. Fifteen minutes later, he was diving right back out of the dredge hole again. These days, you can buy a heavier-type of “safety” airline that will prevent kinking in all but the swiftest of fast water. I recommend this heavier air line to anyone who plans to dredge in swift current. By the way, your air line is also your direct connection to the dredge and to safety. When you connect your air line to the dredge, even in slow water, it should be wrapped around the dredge frame several times before being attached to the air fitting on the dredge. Most air fittings are made of brass. If you should need to use your air line to pull yourself to the dredge in an emergency, it is better that you not have to depend solely upon the strength of a brass fitting! Nearly all experienced dredgers are aware of the fact that their air lines are an extension of themselves while under water. 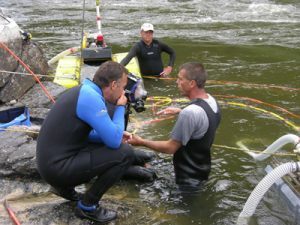 Especially in fast water, it is very important that you not allow your air line to tangle around parts of the dredge, underwater obstacles, and/or the air lines of other divers in the dredge hole. If you cross over the top of another diver’s air line, keep that in mind, so you will be sure to cross back over it again when you return. Each time you go to the surface, to remove a plug-up or for whatever reason, take a moment to untangle your line from anything it may have wrapped around. As a standard practice, all dredgers should always untangle your air lines each time you return to the surface for any reason. I personally never end a dive without first freeing my airline completely, so it will be ready for the next dive. One of the persistent problems of dredging in fast water is the heavy drag on your air line. This can normally be solved by pulling some slack-line into the dredge hole and anchoring it against the current with a single cobble placed on top. This will allow some slack air line between you and the cobble. You want to be sure that your cobble-anchor is not so large that you cannot quickly free your air line in an emergency. Also, when you leave the dredge hole, don’t forget to first disconnect your air line from your anchor. 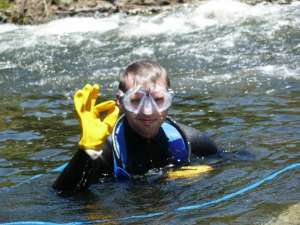 Full face masks are generally not well-suited for diving in swift water. Since they are larger, with substantially more surface area, they are more likely to get accidentally dislodged from your face. This can happen when the mask is bumped on another diver, or an obstacle, or when turbulent water catches it, especially from the side. To further complicate matters, when a full face mask fills with water, the regulator usually does as well. Having to clear the water out of your mask and regulator at the same time can be more difficult and contribute to a panic situation. I personally find that I am more prone to feeling panicky when something goes wrong inside of a full face mask. If your reactions are similar to mine, you may want to avoid using a full face mask in fast water. In any kind of a dredging operation, fast or slow water, it is wise to become familiar with your surroundings as your first priority. Before you begin work, make sure you know the easiest and most direct route to crawl over to the surface in the case of an emergency. Don’t wait until an emergency happens before you think about this. By then, it is too late! Here is some really good advice: Do not tie yourself into a dredge hole in fast water to keep from being swept down river. It is bad enough having a heavy load of lead attached to your body! If you have to tie something, tie the suction nozzle from a point further up river (with no loose rope flapping in your face). Then hold onto the nozzle to keep yourself steady and in place, while you get the hole started. Get rid of the rope as soon as you have a hole started! Generally, the most effective way to maintain your position in fast water is to streamline your body properly, with your head and chest close to the river-bottom and your rear-end slightly elevated. This posture allows the water-flow to push you down, toward the bottom, so you can get a better footing. Begin creating your dredge hole as soon as you can. The hole will help anchor you in place. The larger you dredge the hole, the easier it gets. Some dredgers try to solve their stability problem by putting a lot more lead on their weight belts. Sometimes in turbulent water, more lead can be a help. But, be extra careful when walking out of the water on the slippery bottom, so you don’t overload your ankles and knees and injure yourself. Most importantly, it is very unwise to solve your fast-water buoyancy/stability problem by adding a bunch of additional weight belts. Take it from me; it is hard enough to get one belt off in a hurry, without compounding the emergency with three of them! Sometimes, you cannot manage the needed extra weight without 2 weight belts, but you must understand that a second belt substantially reduces safety margin in an emergency. Additional belts tend to shift around so that the quick releases are in different places, often behind you where it is more difficult to release them during an emergency. Difficulty in finding them in an emergency can contribute to a panic situation and put your life at risk. Whatever else you do, early in your dredging career, it is wise to discipline yourself to never try and swim for the surface in an emergency while wearing your heavy weight belt. It just doesn’t work! In a panic situation, your body will want to go immediately for the surface instead of removing the weight belt. I have personally saved two people from drowning who were trying to ”swim for it” with their weight belts on. By the time they realized swimming was not going to work, they were in too much trouble (panic) to get their own belts off! This does not mean you can’t get a good footing on the bottom and jump up to the surface for one quick breath of air. You can do that in an emergency, as long as the water is not too deep or fast. But, if you cannot crawl over to the surface quickly, your first priority should always be to get the lead weights off as soon as possible. Keep in mind that you usually cannot see the quick-release buckle on your weight belt while underwater. This is because your face mask blocks your vision at that angle. So, it is important to practice locating the quick-release buckle by feeling for it. It is also very important to keep your belt from shifting around, so that the buckle always remains directly on the front of your body. One of the problems we already noted when wearing more than one belt, is that the top one tends to shift around. There is not much you can do about that. So with two belts, you should be prepared to find the top buckle behind your body! You may also find that it is better to first remove your work glove before trying to release your buckle in an emergency. When I get in trouble, the first thing I do is get rid of the glove on my right hand! These are all things you must be able to do quickly and instinctively before venturing into fast water. A wise skydiver would never jump out of an airplane without first receiving enough practice and instruction in how to find his rip cord. Similarly, a dredger’s life should be just as well protected by having a confident ability to release your weight belt quickly in an emergency. Some of the weight belts on the market also include a suspender harness. The only ones I recommend are the ones that have a quick-release, D-ring on one of the suspenders that allows the shoulder harness to come loose on one side when you release a single waist belt buckle. Otherwise, in an emergency, you may find it too difficult to get out of the suspenders, even if the waist belt is released. All this advice is coming from a guy that has devoted a large part of my life living on the edge. You can sit there in the comfort of your computer reading this stuff and feel quite certain that you can manage any or all of these things if they should come to pass when you are out dredging. But when the severe emergency happens, you are not the same person. You are a maniac! You should always keep an eye on your diving buddy while dredging in fast water. When we dive with multiple dredgers on an operation, it is standard policy for us all to keep track of each other. If one person needs to leave the dredge-hole or go to the surface for some reason, he always lets someone know he is leaving. Otherwise, when a diver suddenly disappears, we immediately go looking for him. A person in serious trouble underwater only has about 30 seconds to get it together. This is not much time. What good is diving with someone else for the sake of safely, if you are not paying attention to what is happening with him/her, especially in fast water where there is so very little margin for error? A tender, or anyone else resting at the water’s surface, should be paying close attention without distraction when there are dredgers down working in fast water. If all of this has frightened you, that’s good! That means I have accomplished my goal of alerting you to the dangers inherent in fast-water dredging. Being alert to, and fearful of, those dangers is the starting-point for making your own preparations and contingency plans for dealing with them – before you start working in fast water. What is fast water? It depends upon the individual. 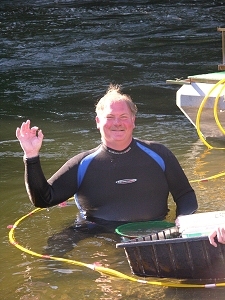 An experienced dredger might be much safer in a typhoon of fast, turbulent water, than an inexperienced person would be in slow, shallow water near the bank. The key for each person is to begin learning in a safe and comfortable environment, gain valuable experience over time, and never attempt to do anything that you cannot easily manage, with safety.